In April, the Nari Dana Production Centre welcomed visitors from Canada – Kevin Dixon, the Vice-President of Operations at International Justice Mission Canada, a global organization dedicated to protecting the poor from violence throughout the developing world. The Nari Dana Production Centre was officially opened on 20 October 2017. The Nari Dana project, CRS’s social enterprise, which employs slum women trained in sewing and embroidery to make products for sale in India and overseas, has been gathering momentum over the last few years. 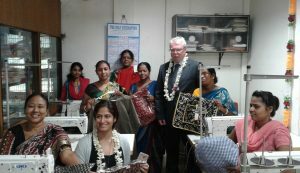 There is now a dedicated space for the women to make their products, equipped with a set of new sewing machines thanks to financial support from the German Consulate of Kolkata. The inauguration started with an opening prayer by Rev Nigel Pope, Presbyter of St Paul’s Cathedral and the Vice Chairman of CRS. 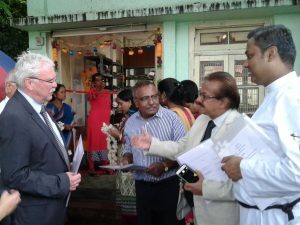 Mr. Jürgen Thomas Schrod, the Deputy Consul General from the German Consulate then assisted Rev Pope in cutting the ribbon to open the centre. This was followed by a traditional lamp lighting ceremony by the guests and members of CRS Executive Committee, signifying the ray of hope that Nari Dana brings to the lives of the women. 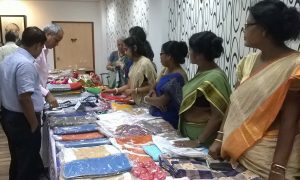 After Rev James Gomes, Assistant Presbyter of St Paul’s Cathedral, had blessed the new workspace, the women were delighted to show the guests a range of their products. Over the last few years, the Indian multinational, Larsen & Toubro, have supported a variety of CRS activities through their Corporate Social Responsibility programme. Earlier in 2016 they donated three new sewing machines to the CRS women’s empowerment programme which offers courses in tailoring, embroidery and knitting. The most talented graduates of these courses have been selected for the Nari Dana project. 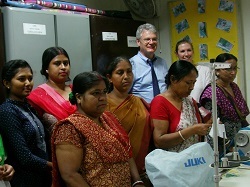 These women are learning to produce very high quality products to be sold both locally and on overseas western markets. Through employment in this small business, they will earn a secure living. Some of their products were put on display at a special event at the Larsen & Toubro corporate office on 26th September.